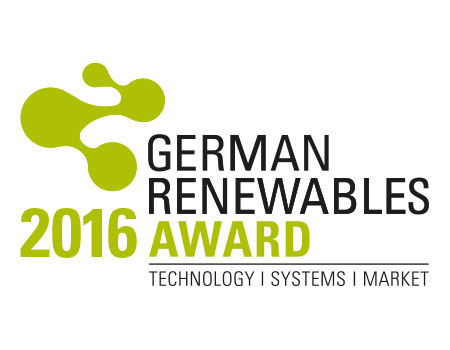 The German Renewables Award competition started in 2012 and is organized by the Renewable Energy Hamburg Cluster Agency. Every year different companies and projects are awarded in 4 different categories for outstanding achievements. FREQCON is proud to have received the award for „product innovation of the year“ in both 2014 and 2016. 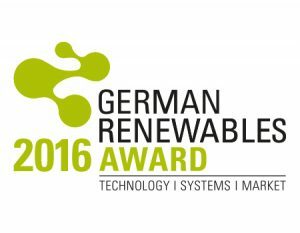 In 2014 FREQCON and Qreon GmbH jointly developed a 2 MW wind turbine design with integrated battery storage system and won the „product innovation award“. The integrated storage system makes the wind turbine very suitable for „weak-grid projects“ and allows off-grid operation for extended periods of time. 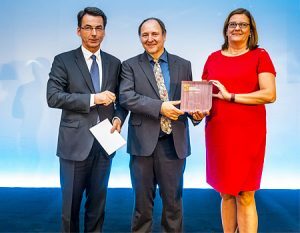 In 2016 FREQCON received the award for the newly developed UGS Ultracapacitor Grid Stabilizer for dynamic voltage and frequency regulation. The UGS combines the STATCOM capabilities of an IGBT-Power Converter with active power support based on high-power Maxwell Ultracapacitors. Compared to other technologies this solution offers improved efficiency, combined with lower investment and operational costs.